I decided a couple of days ago to start prettying up my workspace. Specifically, I decided I'd produce at least one doodle (on a sticky note, of course) each day and then pin the resulting creation to the padded wall of my cubicle. 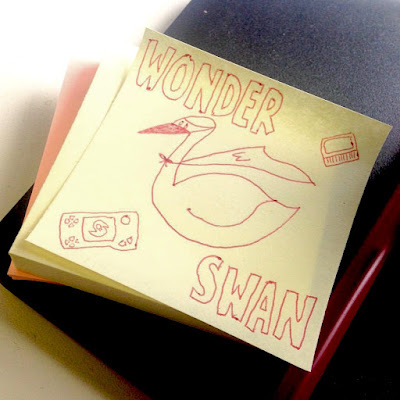 The doodle I came up with on Friday focused on a subject that's been bouncing around in my brain for the last few days: Bandai's Japan-only competitor to Nintendo's GameBoy, the uniquely named WonderSwan. Speaking of which, my Instagram handle is "rainbow_blight," just in case any of you want to follow me there. I regularly use all sorts of other social-media sites and apps, too, by the way--including Facebook, Flickr, Google+, Tumblr and Twitter--so please follow me there (and chat me up now and then) as well if you're into such things. Other than that, do any of you also have the WonderSwan on the brain at the moment? Or are you otherwise fans of this quirky handheld? If so, please show your love in the comments section below.